The suspect in the eyes of the Law enforcement agencies can be arrested and they have chosen to arrest Hon Chitotela…so what does that got to do with me… the suspect, and in their wisdom they choose to arrest him so what should i do. And we are fighting corruption and if he’s corrupt, he is corrupt. So they have to prove in the courts of law and I hope they give him a chance to prove himself. If he’s corrupt, he’s corrupt. But you see what I don’t want to do is to politicize the fight against corruption. Remember how I lost Chishimba Kambwili. They came to me and they said he is corrupt, and I said investigate him, they investigated him, along the way, they said he’s not cooperating, he’s insulting us, he’s very vulgar, am sorry to say that, but he’s vulgar, he can be vulgar. They were all crying in my office, and I said ‘What do I do?’ In my judgement, I said ‘The best is to remove him.’ I removed Chishimba. Up to now, we are waiting for the ACC, the DEC and all those who brought allegations against him to prove their allegations in the courts of law. So, you want me to lose Chitotela on that basis again? Am saying No! I will give them leeway to investigate and arrest and bring to court culprits. But I will not interfere I will even fund them to do their operations. But those who are calling for the removal of Hon Chitotela now, I say no, give him space but don’t interfere with the process. Bring your evidence and let him also have… he’s there in court and let justice be served and I am a lawyer and if you look at the bill of rights I think article 18 starts with presumption of innocence. So as far as am concerned he is innocent, even Chishimba Kambwili is innocent, but look at where Chishimba Kambwili is..no Lungu is fighting Chishimba kambwili” I have never fought Chishimba Kambwili. What I had was a report from the law enforcement agency that Chishimba had done 1,2,3 wrongs. I said “go investigate him” and many others I said “Go ahead” and they went ahead, at the same time they said “we can’t get anything; no corporation from him.” and I said “what do I do?” in my wisdom I removed him from office. Having removed him from office, the rest is history. He pledged to work with us…the next thing he was saying am corrupt. I don’t care what has happened but what am saying is having lost Chishimba Kambwili through allegations of corruption by the same forces I don’t want to lose Chitotela in the same manner. Am saying may Chishimba Kambwili find justice, and may Chitotela find justice, and may those who are alleged to be corrupt find justice. That’s how the rule of law works. The precinct, one of the precinct of law is there is no one above the law. Right? When the police feel like investigating you, they will investigate you. When they feel like coming to your home at night to search, they will search. And I can’t tell them go and search Tom Njovu’s home or that girls home. Yt’s not in my mandate. So let us not politicise the fight against corruption. There is a perception that “by doing that they are weakening Lungu.” they are not weakening me. They’re just killing the systems we have set to fight corruption genuinely. So what comment do you want me to make? May justice be done that’s it. “No am fighting Chitotela because he knows too much about me.” what have I done? Mr President, the best would be to send him on leave and allow the process of investigations to be done without concern of losing evidence. So Emerine was guilty before being proved innocent ba Mr Lawyer? Ala no matter how much you try to cover your tracks and play double standards, your day of reckoning.will surely come. This is a Head of State talking really sad…Zambia deserves better not this weak lazy *****tt…he is not even sound like he is in charge. He expects ACC to go to Chitotela’s office and ask him for permission to search his office whilst he is there. When I tell people that these are LAZY LUNGU WASTED YEARS THAT WE WILL NEVER RECOVER people think its a joke …read that statement again!! Mr. Lungu, it was a mistake to appoint him in the first place after he was fired in 2013 for corruption by late President Sata. Then to add salt to injury, you put him at the most corruption-prone ministry, Ministry of Infrastructure. Refusing to suspend him is sending a wrong signal to other plunderers. It’s actually giving Chitotela an opportunity to destroy evidence & use state machinery to intimidate witnesses. Remember how he issued death threats to fellow MP Cornelius Mweetwa after a fierce debate in parliament. What more where his freedom/job/life/family is at stake? You will see PF supporters like JUNIOR, Senior Citizen (Originally MMD) shying away from this …and childish bloggers commenting with different names. How can a lawyer president keep an accused in office? Doesn’t the president realise that he will jeopardize evidence and threaten law inforcement officers? Learned Lungu must know that proper investigations can only be done if Chitotela leaves office otherwise Lungu is defeating the purpose of carrying out investigations. Chitotela won’t cooperate in anyway for as long as he remains Minister. Point of correction Mr President, please do not refer to yourself as lawyer simply because you studied law and had a go at it sometime back. A lawyer/solicitor, is one in practice. Ever hard of a term “Conflict of interest” Mr President? Me President, in Criminal Law which you may be familiar with, it’s called/known as “perverting the course of justice”. And this is what you are doing and it’s also what the accused should be charged with in addition to others if he went back to his office. POTROZ ECL is 100% right. POTUS DJ Trump is currently being investigated vicously and he is still POTUS. They taught us democracy yet they do it differently. Under the watchful eye of relevant institutions Chitotela can be investigated as a minister without a hitch. I can only side critics to ECL’s point of view on Chitotela’s work being disturbed on victimizaton and business flow’s front rather than interfering on investigations. Yes, thorough investigation take time. Chitotela may be charged prosecuted and “nolle prosequid”. Stop harrassing and bearing false witness on innocent people. What if CK is innocent indeed. Kind a feel the POTROZ’s frustration, budda suspects got rights to fair and speedy trial. This will die a natural death if top guys are involved, nothin’ is ever done… such is the rot in this country. If you need anymore evidence that this guy is a disaster to this country you need to have your head examined. I start to like Edgar again. He is now clear on Kambwili, and Kambwili told them he can’t leave. Dora has been insulting OF and Ba sata etc, now she is number 4. Bring back Kambwili next week and give him a ministry. Mr. President, Chitotela was cited in the FIC report. His bank account had millions of dollars which can’t be explained. Was it not your government which attacked and threatened the FIC for publishing the report? If your fight against corruption was genuine, you would have removed Chitotela back to then. Several other senior government official have been cited in tthe FIC report but nothing has been done. You pretend to fight corruption by going after small fish and leave the big fish to swim free. What a sham. I have always stated this..Lazy is out of his depth…how PF can let this guy go and stand again unopposed is beyond me. Especially fi upnd filebosa kwati nimbwa isha lwala Ebola. Well said my president. Zambia is still behind you. I can’t believe these words are coming from a lawyer. God, why? Its skin cringeing reading this..not even his minister Kamponygo of HomeAffairs can sound this weak. But truly speaking where is the case of chishimba Kambwili since he was fired, the ACC has been quite. And that ladies and gentlemen is the direction our captain is steering the ship. Akanwa kamilandu kalasabaila so the bembas say. Nothing is making any sense with this response, it is totally unbecoming for a leader who is serious with fighting corruption to behave in this manner. This Chitotela has a load of information that must be removed from his offices before they implicate the powers that be. Flabbergasting indeed to say the least. This so called fight against corruption is hogwash to wood wink the masses while playing to the gallery. Shame indeed. Do not be surprised to hear that Chitotela office caught fire over the weekend…this is why ministers are suspended to pave way for investigation; we know Chitotela’s has more info on him involving AVIC and all those freebies they have building in Tasila’s ward in Chawama. I agree with the President, on 22 of October 2012 the Minister of Justice Hon Winter Kabimba and Minister of Defense Hon GB Mwamba were investigated whilst in office by ACC. And you think that is right? pio, let us not set medio.crity as a standard for reference. We have laws in the land, please. What you are saying is not different from telling your wife not to report you to police after catching you defiling your niece because your neighbour’s wife never reported her husband after catching him. He is already regretting to listen to ‘WRONG’ advice of arresting Chitotela. The ceiling fan has been hit by pupu already some MP and state house official are soiled. News Diggers just showed us the tip of the problem. This is the most useless President in the world .Mark my words ,this is a side show to diverge Zambians attention from Esther Lungu’s wasteful spending in America . Lungu does not have the will or capacity to fight corruption . So if you are suspected of any wrongs and you refuse to cooperate you can go free? Or aren’t the investigative units supposed to prove beyond reasonable doubt that you committed a crime whether you are cooperating, insulting, very vulgar…? So CK is bouncing back? It looks like some behind the scenes shenanigans are going on. He will bounce back and all will be forgotten as he too has too much dirt on Lazy…Zambia needs to do away with all of them. This is laughable but it no laughing matter. Seriously, ACC officers went crying to Lungu! He is making fun of ACC that they are spineless! Holy smokes! This country is in sh!t. They are going back to him because his close advisers are implicated …reading this should convince lawmakers to sort out our governance issues ..ACC is impotent if the Head of State is also weak and corrupt like Edgar. I am not a lawyer like you and ECL but prosecuting a cabinet minister whilst he is in authority is a none starter. The best ECL could have done was to suspend Chitotela, or send him on leave so that he doesn’t interfere with the prosecution using his ministerial position. ECL must not play double stands here. Ask yourself why Kabanshi was dismissed even before her matter was concluded. We are not trying to be prejudicial but we expect better from our lawyer president. The ACC or whoever started this investigation has done it without restraint thus far! It can only make sense to fire or suspend RKC if it is issues related to his office in which he can tamper with documentation or intimidated his subordinates. However, in this case, it is an issue of Dishonorable Chitotela concealing ownership of the two named properties suspected to have been acquired with proceeds of crime!!! Ba David N, Chitotela has been charged with 2 cases of corruption. Corruption is corruption and is a crime whether it relates to somebody’s office or not. Imagine he’s convicted whilst he’s a cabinet minister, should we say because the case is not related to his office then the conviction holds no water? Him being a public official, it’s standard practice that he is suspended to pave way for smooth and impartial investigations. That’s all we are calling for. ECL is not short of clean people to appoint. “What has Chitotela’s arrest got to do with me?” Really?….this question is coming from the Head of State who is a lawyer? Chitotela is no ordinary person in society but a serving senior member of Edgar Lungu’s cabinet. The Attorney General should strongly come in and advise the President to do the right thing. My foot! Where are we headed to as nation? Imagine this is an Infrastructure Minister overseeing the overpriced $1.2 billion motorway and billions of RDA contracts where AVIC and proxy companies keep popping up…..I keep telling you guys that Lungu is not a leader the best he can be is a PS or Junior Minster not a President …he is too weak imagine John Magufuli saying this or Sata. Gentlemen, you all have to be rational even with your wanton hatred of the man at plot 1. The investigative wings are establishing whether this gentleman is culpable and they have started with a cocksure case of concealment and HAVE arrested him. Then they need to proceed to establish the legality of the purported transactions of millions of dollars and hopefully prove a case of money laundering, fraud or bribery. The statement ECL has made here is that people have come up with allegations of alleged corruption but later it has been proved that it was just hot air after all!!! Let the gentleman live his normal life until he is put on his defence. You reappointed Chitotela after being dismissed by your predcessor Sata over similar charges. The HEAD OF STATE has spoken. With the presido’s statement, all the fired Ministers and PSs should be reinstated and continue working until the due process of the law has been completed. Hon. Kambwili and Hon. kabanshi were unceremoniously fired on mere suspicions. For Hon. Kabanshi its even worse because we were later told the missing money was in the ZANACO Account and if money was found why the presido has not reinstated her up to now? These are indeed double standards and now he is trying to protect a real criminal. I really wonder what will be left in the Govt coffers by the time these criminals and morons will be out of Govt. The next Govt has a mammoth task to restore order and discipline, more so, to bring back the amount of money that has been stolen by this thieving Govt. Mr Lungu has disappointed us by failing to act rationally regarding Chitotela’s arrest. One can only conclude that the accused is special in some way. This might just be harassment to put him back in line if he has overstepped his boundaries. We all know that a lot of government and ruling party officials are involved in corrupt activities. Chitotela is definitely dirty. Lungu needs CK……the first signs were CK touring a market and going on radio in NP without being harrassed…. Those who surely UNDERSTOOD the matter (case)of Chitotela , will feel that , that was an EMOTIONAL SPEECH from the head of state. He knows exactly,what is behind the scenes.Some narratives mentioned by the head of state was not suppose to be mentioned on public but HE had No option . Investigative wings altogether have created air punching bag.They have proven to be failures in case of CK and others, WHY SO…? I smile a rotten rat in investigative bodies. Bati that CK has given lungu and his pf gang sleepless nights….. I said from the start….the only corruption CK was involved in was bullying mines to use his companies……some like ndanji had given CK 3 months before he gets arrested. Now look, lungu is cornered …. CK is bouncing back in government. In the absence of CK and HK PF in Northern province is destroyed. With the going of HK president Lungu will need CK. Let’s wait and see. Why should he say I dont want to loose Chitotela the way I lost Kambwili. 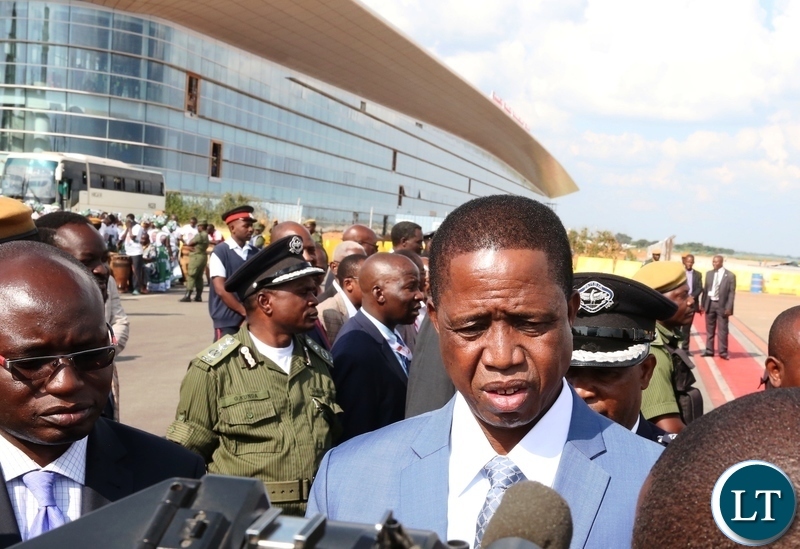 If CK gets back in GRZ , expect CK to be the next president of the republic….Zambians love a loud mouth street orator…..
Let’s only hope he has learned from being in the wilderness a taiste of his own medicine he gave the opposition when he was in grz first time round…. What an EMOTIONAL REACTION of the Head of STATE. He knows exactly what’s behind the scene.some narratives mentioned by the Head of STATE were not suppose to be mentioned on public eg ( highlighting failure of investigative wings) but HE has no option.It sound like the investigative bodies altogether have failed to prove beyond doubt in allegations of CK and others. Something that he is also disappointed with. Time is the answer to all these issues. Do we hear any comments from the investigative wings especially ACC must come on the media to up date the nation. I have said it before and I ll repeat it…its only in Zambia where such comedy keeps on unfolding!!! Spaka don’t say that “ CK is giving ECL/PF sleepless nights “. The president is saying that OR CONFESSING that investigative bodies went to HIM (ECL) and they said that CK is corrupt.And the President asked them that “ WHAT CAN HE DO ? “ they demanded him fired for paving leeway for investigation of corruption.Since then nothing has been proven right. The investigation bodies have failed to prove beyond reasonable doubt in court that CK and others were corrupt. This is why he’s saying that he can’t fire Chitotela.However, he went on to say that if Chitotela and others were corrupt he can’t stop the law to take its on coursework. Then why did he not fire mono , the head of ACC ?? I agree with you sir.How about those many professionals dismissed from the civil service after being accused by cadres that they were political? When are they going to get justice sir, since they have already been fired? We are all Zambians! In short, the President is apologizing to Kambwili for wrongful dismissal and the President is telling us that he has no confidence ACC but we will accept this. You can imagine the message he is sending to other Ministers. They must be saying guys let us eat mwibala, coz we have a jet fuel hungry president who doesn’t care what we do. Dear God above in Heaven what did we ever do to you to give us such a President. but will not accept it. @ Brian bugga, you are wrong what about those who fired on mere speculations Emerine Kabanshi, Ministry of Education officers and other Government workers. Liato was arrested for two years by merely finding him with cash that was suspected to be proceed of crime. Haven’t we seen pictures of trunks loaded with dollars, pounds, etc, you name it, at the minister’s house? Why is Chitotela so dear to the president? This response from the Head of State could have been summarised into no longer than two short sentences. I am not getting the sense of “No to Corruption”. Mr President, Dr. Chiluba said the same regarding the case of Remy Mushota. But look at the ending of Dr Chiluba. Mr President, listen to this carefully: “Chilonda potsuka chibaba”. A Chewa proverb literally translated as “a wound is painful whilst cleaning it”. Cleaning/getting rid of corruption will be associated with pain, and that is the sort of pain you should be prepared to live with at your level if you want to have a dignified ending. Weak weak president. He lacks balls and leadership skills. To pave way for a fair process of prosecution is by suspending the minister so he does not use his power to interfere with the process. Weak corrupt leader. What kind’a thinking is that? The ACC gotta work with evidence and some sort of teeth. How can the ACC end at claiming the suspects are not cooperating or insulting them. Call for reforms. #1.5 Jay Gay, so who is your preference for President, Trib.al Hacks? Don’t say you have no preference because we can’t have a country without a President unless you are reckless. Reckless as in trib.als. It is out’a with reality. I think he just got rightly tipped. Moles could be planted in institutions like ACC and Judiciary like siavwapa to champion weird causes. You kind’ a read ECL’s realization amidst his frustration. He is slowly reckoning. Before you realize, you’re just bear bones called skeletons. All the “cream gone”. Conclusion, ECL is on the right track. And if it’s Trib.al Hacks as we know you, I refer you to the article by Sishuwa Sishuwa and the BBC Hard Talk interview. Also remember that he has mot been to a convention in his party. CK’s corruption allegation could drag to eternity. What kind’a investigation does the ACC run. I call for reforms. Give them teeth to bite. They are the people that should put culprits away budda, looks like we loopholes and deliberate drag with no meaningful options. Reform the ACC. Is corruption that hard to prosecute? President Edgar Lungu is the most intelligent president Zambia has ever produced. He knows how to put records straight. He will not suspend any of his minister based on allegations but once proved wanting. The moment the courts proves any of them was truely involved in corruption, he will fire them. Just in a short interview, he has made his position on Chitotela and Kabwili clear to the public, intelligent ECL. ACC and DEC should learn to prove their allegation in the courts of law in record time. Its now almost 3 years, they can not prove Kabwili is truely corrupt, dispete claiming to have evidence against him. SHAME…. This is not the first time a serving minister is being investigated by ACC or DEC. Kabimba as Justice Minister and GBM is Defence minister were investigated by ACC and DEC.
…….By permitting ACC to investigate that man, you have NO CHOICE but to suspend him otherwise you will be guilty of impeding ACC in their investigations. Look at this way, ACC launches investigations against their boss and you give consent, can you allow that boss to continue working in their position. I think not, for obvious reasons. This argument of innocent until proved guilty is true but it is empty in this context Mr President. I’m not saying hon Chitotela is not guilty of the accusations but as at now they are just accusations. As we speak the President of the United States and his government are under a live investigation but they are still serving even as arrests are being made. But in Zambia we have such bitter haters that would like to see blood based on accusations alone. Ask yourself one thing? If this was your father, mother, brother or yourself accused would you not welcome the Presidents stance? Such bitterness is misplaced. The Bible says do unto others as you would have it done unto you. Its called “perverting the course of justice”. In a lay man’s language he is threatening the ACC to carry out their duties. He is saying “you dare touch him – he is my thief” kwasila. Again conflict of interest and this is a lawyer who fails to declare interest as an appointing authority. And by the way he is not a lawyer because practicing lawyers know things. Kwishiba utuntu not just yelling and threatening officers who are doing their work. This man is encouraging corruption amonest his ministers. CK is a thief big time and still supports him ati I lost Kambwili – a thief. Birds of the same feather…!!!! The whole system needs to be reformed bane…I dont forsee ACC making headway in their investigations and the message is clear from the head of state… Chitotela is very innocent until the investigative wings prove him guilty. Corruption is very complicated just as the word itself so lets not be cheated here that Chitotela will be found wanting…The whole system is rotten!!!!!!! UPND Opposition party pundits on this site are hilarious! False, fake and twisters of truth. But here is the joke of the day, His Excellency rightly cited the law in question; quote, ‘bill of rights I think article 18 starts with presumption of innocence..’. Okay end of story right? Not with UPND. YOU SEE THEY HAVE NO KNOWLEDGE OF THAT BILL BECAUSE……?? HH, UPND does not recognise it because they refused to take part in the process during the constitutional changes. Basically we are just dealing with ignorant, stir crazy, rabid citizens whose modus operandi is ‘smoke and mirrors,’ causing confusion and inciting anger, violence and anarchy. In that confusion they hope to cheat citizens out of good government. These people are dangerous.